Once upon a time, there lived a nobleman’s daughter and a duke…. Magdalen of Mallin has received a proposal from a duke. It almost seems too good to be true. Her future looks bright and hopeful now. On her journey to his home, however, she discovers that things are just that, too good to be true. 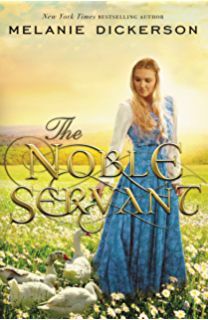 Magdalen is overpowered by her maid and in order to protect herself and her friend, she must trade places with the maid, allowing the servant to marry the duke. Magdalen is trapped, stripped of her identity and forced to tend to the geese. She soon befriends the shepherd boy and begins to suspect that he is carrying his own secrets. Can she trust him to help her gain back her rightful place? Or is he working with her maid, making sure Magdalen stays quiet? I was very excited to jump back into another Melanie Dickerson fairytale. Her writing style is so easy to follow, her characters are entertaining, and the stories themselves are like little portals of time travel, taking me back to happy days of my childhood. And that for me, is the best part. I also have to mention the cover image. I love how colorful it is, it suits the fairytale theme so perfectly. Melanie Dickerson has become a new favorite author of mine. In fact I bought all of the other fairytale books she has written that I had not read yet. If you are looking for a fun, light read with a bit of childhood reminiscing, I highly recommend this book, as well as The Silent Servant, the other story from Ms. Dickerson I have read.